Otzi is another name for the Iceman. Otzi died in the Alps. He lived during the Bronze Age. 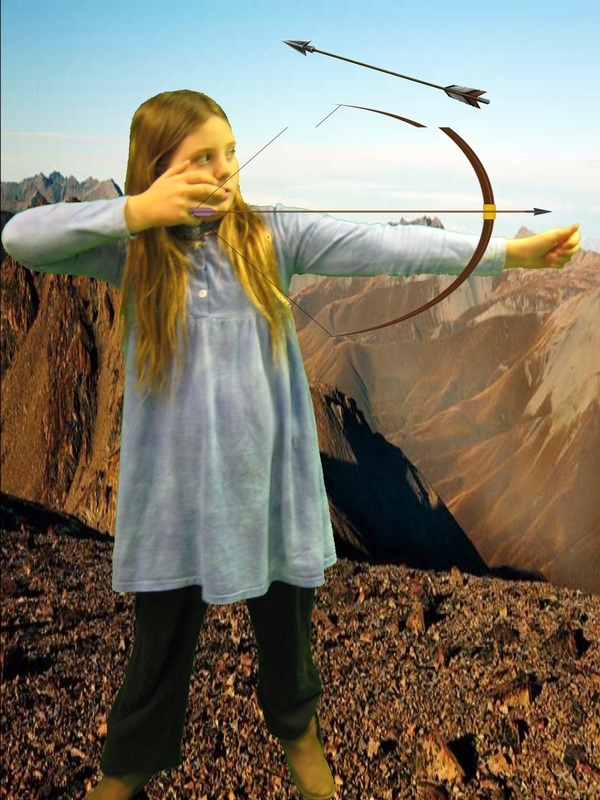 Otzi died because somebody shot him with a bow and arrow. He is the oldest well preserved body in the world. He was found on 19 September 1991. He was 5 feet 5 inches tall. He was frozen about 5,300 years ago. He was found by hikers. He was found on the Austrian and Italian boarder. He was found with one shoe and an ancient flint axe. Scientist used carbon dating to find out how old he was. 24 hours after Otzi was in the Science lab the corpse began to thaw and fungus began to grow on it. They put Otzi in a refrigerated room that freezes the corpse. They had to carefully scrub off the fungus so they won’t destroy the corpse. The Austrians and the Italians were fighting over who owned the body. The Italians won because Otzi is now in the South Tyrol Museum of Archaeology in Bolzano, Italy. I was reading a book about the Coliseum when I was somehow sucked into the book. I figured out that I was in Rome, Italy. I walked around and I saw it. I couldn’t believe what I saw. I glared at the Coliseum. I took a tour that was free. There were twenty one people in my group. All of them were French. I still couldn’t believe what I was gazing at. I figured out that it was created in 72 Ad and finished in 96 Ad. It was created for an emperor named Titus Flavius Vespasian. It is 157 feet high, 620 feet long, and 513 feet wide. You could seat 145,000 spectators. There are about 80 numbered entrances that I walked through on the first floor. The second and third floor each had a statue. I should have sat in the marble seats on the second and third floors but I sat in the fourth floor where there are wooden seats. The fourth floor was for woman and the poor. The third floor for slaves and foreigners like me. The second floor for the middle class. The first floor for the distinguished private citizens. Then I saw the oldest book I have ever seen. I touched it and I found out that I had been sucked into the book. Sudenly I was back in my bedroom where I was reading the same book. It was an incredible trip. I can't wait to read a another book! 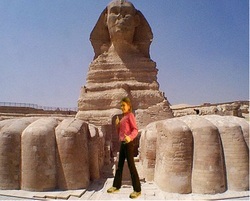 I was skipping by the Sphinx on a field trip. I saw a scientist who was studying the Sphinx and this is what I learned from him: The Sphinx is an ancient symbol of Egypt that is made out of limestone (240 feet high and 66 feet long.) The great Sphinx is almost 4,500 years old. The Sphinx is in a restful position of lying down and watching over the pyramids of Giza. Some limestone is softer than others and that causes erosion. Also the Sphinx is open to the wind and it got covered with sand. Some people say that the Nile flooded and caused more erosion. Some people try to bring it back to its original form by applying mortar but the mortar only causes more erosion. All in all I learned a lot about the Sphinx. I woke up with a loud bang in the Babylonian main city. Then the walls fell down. I Looked outside and I knew right away the Assyrians were invading! 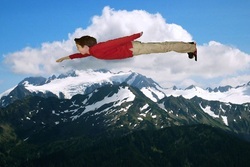 I flee from the crashing building. The guards were fighting to save our kingdom. BANG…then I knew it was a battering ram. The battering ram is super destructive it knocks down the walls of stone. They can knock down anything from iron to wood. I jumped from the natural arch 100 feet high from the water below. 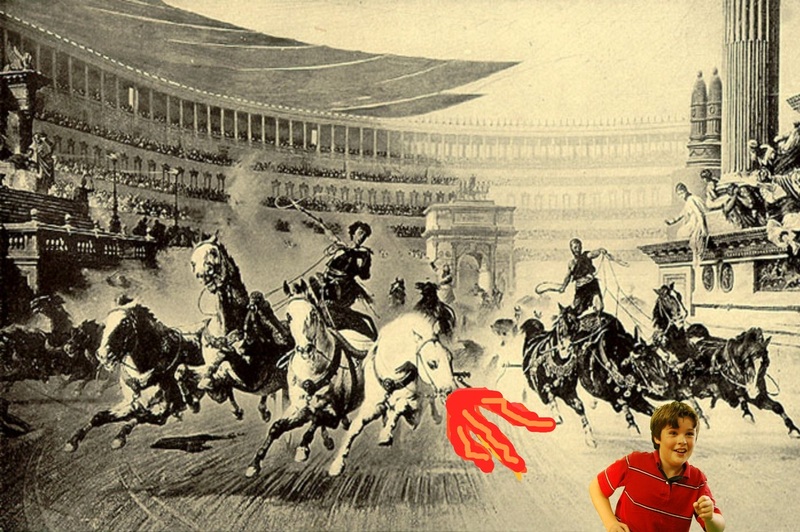 SPLASH I swim to land then I start sprinting away from the siege towers, burning houses, battering rams, and the howling laughter of the Assyrians. The imperial army was no more. We escaped with our king. We built another empire just to be crushed again this time I fought. I fought hard and powerful. This time we had help by the royal guard. They were so powerful only two of us escaped with king Uratu at our sides. They let us live. I don’t know why. Then we stumbled upon the Babylon main kingdom. We told the king what they did to us. The empire of Babylon was defeated in the past as well. They were outraged because we were the (protectors) of their trade center with other empires. Soon we waged war on the Assyrians. After long years of combat we WON. Greece has great art and architecture! Sorry, getting ahead of myself again. Let me explain. I was lying in bed last night, sleeping, (or trying to sleep) when I found myself shooting through a dark tunnel. Yikes! Suddenly, I landed right in the middle of ancient Athens. I looked around puzzled. My head was spinning. It took me a while to comprehend where I was. Just then, I heard a woman calling my name. 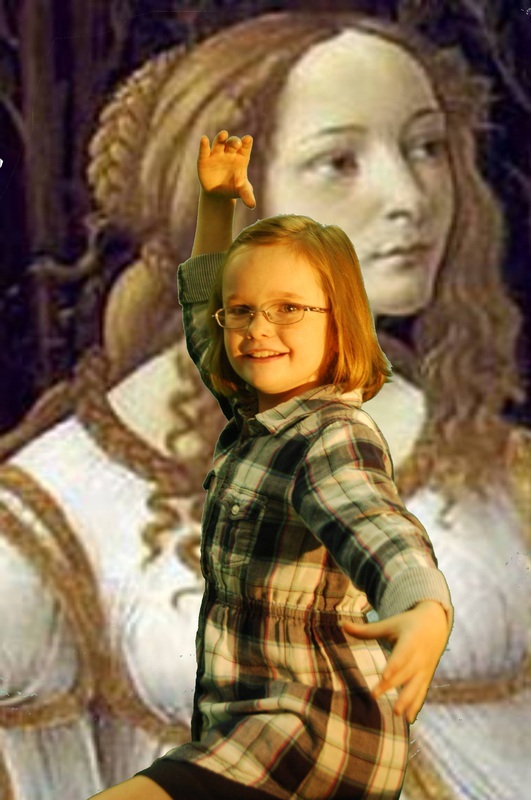 Now, you’re not going to believe this, but the woman was Athena! I told you that you wouldn’t believe me. Let me tell you, she’s a great tour guide. (Plus I got to ride in her magical chariot pulled by magical horses. Score!) Here is what I learned: There were ongoing competitions to see which city-state had the best architecture. No wars where started, but I would not be surprised if there were plenty of fist fights. Their statues where perfect, with no flaws because the purpose of Greek art was to display human perfection. (Even though their Gods were not perfect.) They invented three types of columns; Doric, Ionic, and Corinthian. Doric was the plainest. In the middle, the Ionic has lots of scrolls, and the Corinthian is very fancy, with swirls and engravings. Most temples and buildings where made out of limestone or tufa, the main material there. The Greeks also used marble, but it was very expensive, so they just used it to decorate. The typical Greek style was rectangular with a triangle ends to the roof. I noticed when I was looking at pictures of temples that they had cobbled walkways in between buildings. Sounds like sidewalks! Look around, and you’ll see that a lot of the styles of architecture we see today are taken from the Greeks. I step out onto the rocky ground, the fresh air is overwhelming. It feels great to get outside in the fresh air after being trapped on a plane for five hours. 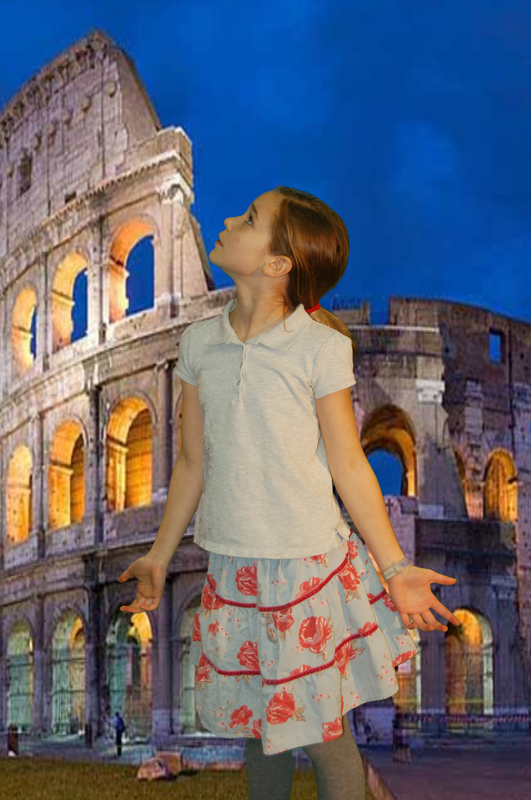 This is me; my class went on a field trip to Greece. We voted between Italy and Greece we ended up choosing Greece. 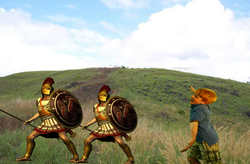 My friend and I wanted to go to Sparta, so we were pulled by a chariot and we landed in the middle of the Athens and Spartan war. They thought I was an Athens soldier so I ended up being captured and became a helot. There were not a lot of soldiers but they had immense power. I could have been there for the full 27 years, but I ended up proving that I could endure the harshness like the Spartans by hiding a fox in my cloak. I pretended to die, and then when they were distracted I made a run for it. I’m glad I did because later I heard that they thought that they their helots might turn on them so they turned their camp into a fortress and started to treat their helots a lot worse. After that I agreed with my friend that that was the most memorable field trip in the world of field trips. I took a trip for history to Eygypt. 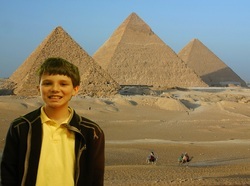 I visited lots of places like the pyramids. But my favorite part was the Sphinx. You can see from the picture. While I was at the Sphinx I got some interesting facts about it. The face of the sphinx represents the head of Khafre, an Egyptian Pharoh who built the second pyramid of Giza. 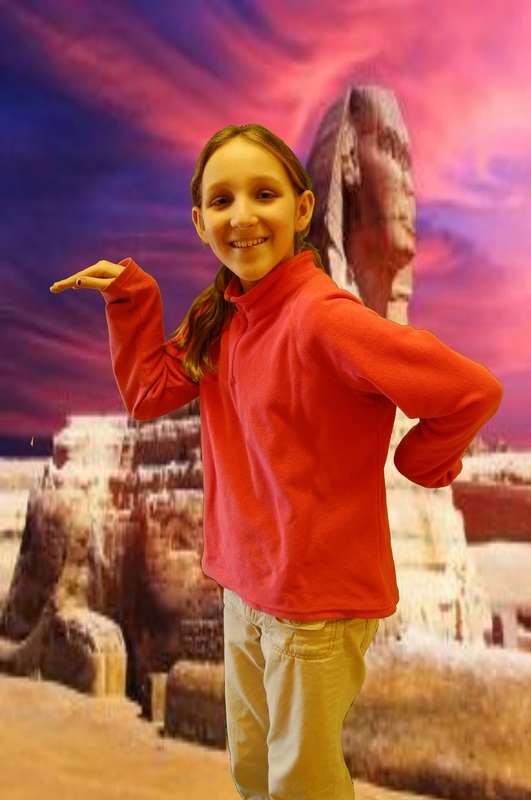 The Sphinx measures two hundred sixty feet long, twenty feet wide, and sixty feet tall. I probably look like an ant to the Sphinx!! It was built from limestone and is the largest free standing sculpture in the world!! It is said that the Sphinx's nose was broken off by a cannonball that was shot by Napoleon. 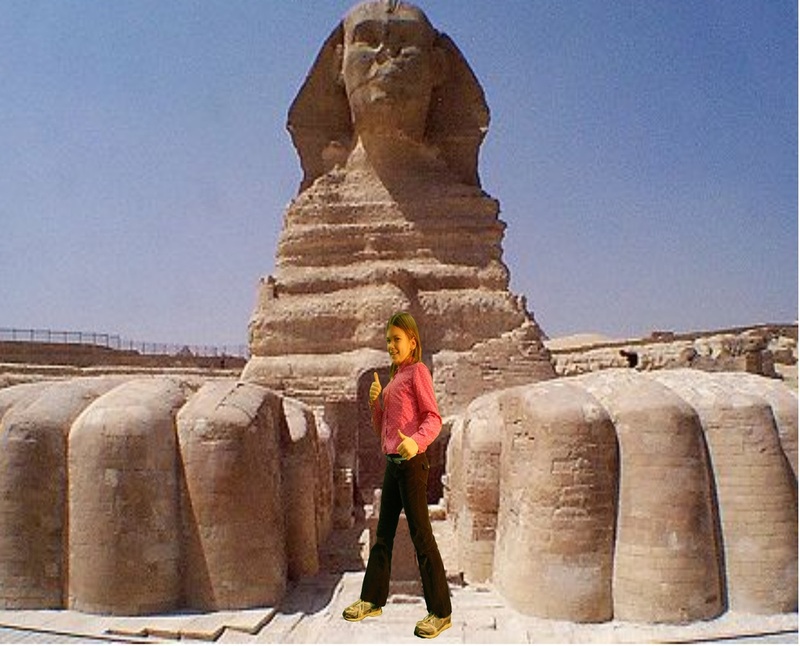 If you ever take a trip to Egypt go and see the Sphinx. It is awesome to think about how hard it must have been to build, since it was carved from a slab of limestone. I hope to see you in Egypt!!! I am a scientist. I am one of the Otzi scientists. It was a huge honor to be part of the Otzi team. This is Otzi the iceman. He was found on one of the mountains on the edge of Austria and Italy border. We think he was found in Italy. We were not sure if he would stay preserved throughout our testing but with high tech tools and computers we were able to keep him preserved. 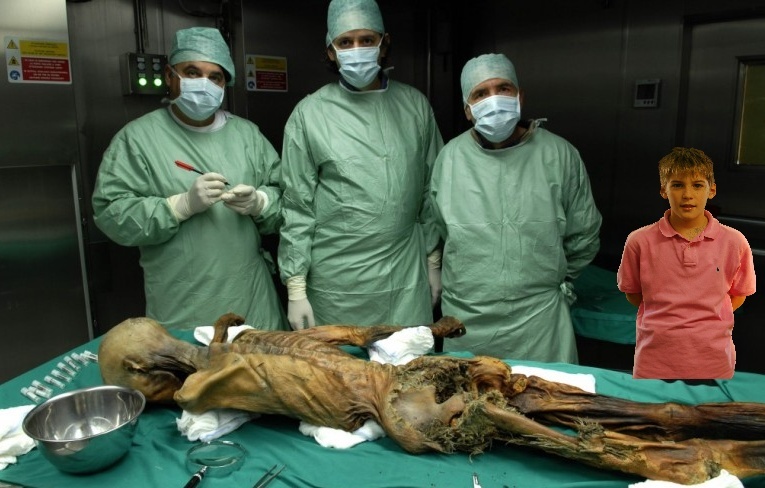 Otzi is one of the many mysteries of the world. If he had died a few feet away from where he did the world may have never known him. He was found in 1991 by 2 hikers. We have come to the conclusion that he has been in the ice for 5,300 years. That is a very long time. An arrow head was stuck in his left shoulder. We think that an arrow killed him. On Otzi’s left side he has a tattoo. 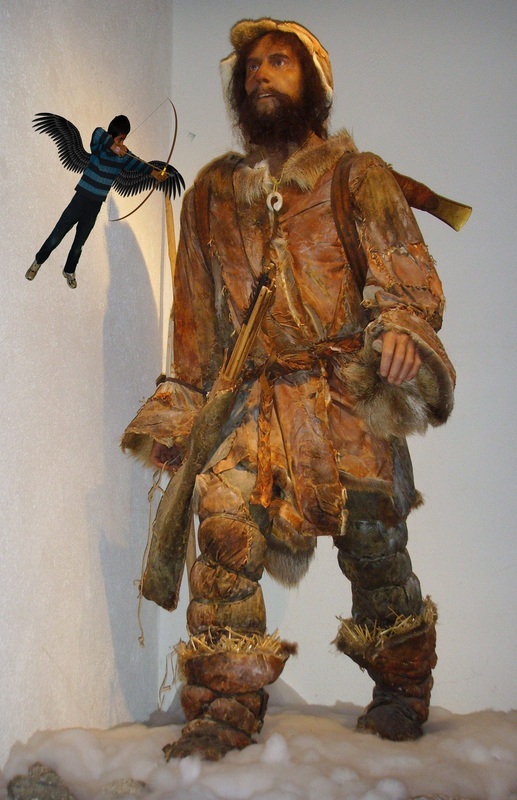 Otzi was actually not that fat he had very little body fat. Really I am not that surprised because he had to make his own food. The thing I like the most about Otzi is that he has been mummified for that many years. It is almost impossible to be preserved for that many years without being eaten up by bugs. That is why I like Otzi. 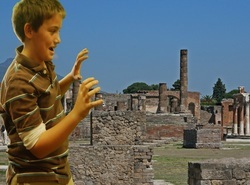 On the class field trip we went to Pompeii. They made an awesome picture of me. They have holes in their roof above from the fountains. The rain would fall into the fountains they would that’s how they got water. We had a tour guide. She knew everything we asked her. They have holes in counters for food next to the road. For when it rained they had stepping stones when they wanted to get across. We got to see the mummified people. They poured plaster in the remains of the people to make the form of the body. 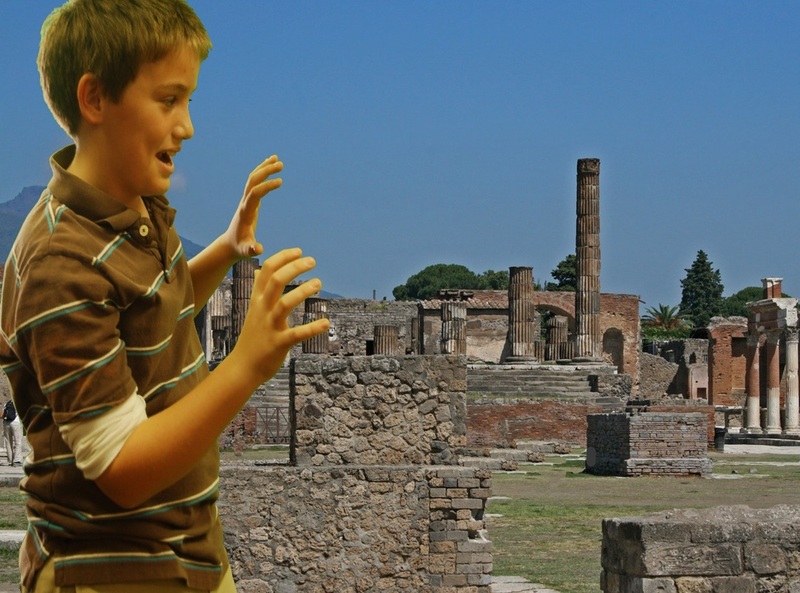 We have lots of pictures of Mount Vesuvius. You were not allowed to touch any of the walls. They were too old and worn out. We got a taxi and went to the airport we got lost and almost mist our flight back to go on the 14 hour airplane ride back to America. While I was in Greece I learned that the ancient Greeks where amazing artists. They made the best vases until 6000 B.C. I enjoyed the museum that had the three story building portrait of Aphrodite!! The goddess of beauty. She is my favorite goddess!! The reason I like Aphrodite so much is I am beautiful like her. I also learned that the goddess Selene is the sister of Helios!!!! The reason I like them so much is because I enjoy the day and night. They are the god and goddess of night and day. The reason I like day and night so much when you wake up and go to sleep is my favorite part of the day. The when I walked into the next room I saw a gigantic statue of the god Zeus. Zeus is the king of the gods. The god of the sky. On the statue there was a clay and marble lightning bolt. The reason I like those goddesses and gods so much is because I saw the fifth grade movie of 2012-2013. I learned so much about them that I decided that I wanted to go to Greece and learn a little more. Because the fifth graders taught me so much, I could only learn a little more. I was really excited so, I learned more than I needed to learn. When I went to college after spring break I made an A++ on my history test on the Greek gods and goddesses. I would love to go back to Greece again someday!! I went to Assyria and saw the most amazing things. I had bread and saw paintings. I saw the old library of Nineveh. We also saw a old battering ram and a powerful weapon on wheels. We also saw slingers that hurdled stones at walls. One of the really cool things there was a war going on. We decided to visit the war but we got a little close and an army man gave us weapons to fight. I used my bow and arrow to shoot a warrior. It was cool but I was glad to get out of there. I finally got home and I researched more on the Fertile Crescent. 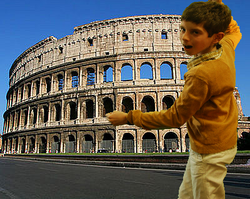 I found out that my traveling group accidently traveled back in time and went back to 612 b.c. It turned out to be the war between the Assyrians and the Medes and Chaldeans who had joined together to fight the Assyrians. We left before the war finished so we didn’t get to see who won and it was the Medes and the Chaldeans. I had a huge project due on Phoenicia. It was going to count for ninety percent of my grade. I soon decided that I needed to visit in order to get an A. I stole the time machine from the fifth grade movie last year and at recess I visited Babylonia. When I popped out of the time machine I was on the streets of ancient Babylonia. I walked around a while exploring the place, I didn’t have to worry about time, I set the time machine so I would get back to the playground five minutes before recess was over. Soon after I stumbled upon a clay wall with some of their writing on it, when it came to me I could write part of my report in Phonecian. I walked up to the wall and tried to find out what any of it meant but, it was useless. Then my curiosity got the better of me and I took my hand and placed it on the wall to see if the writing was painted on or if they had carved it into the clay. When I tried to take my hand off it was stuck. Soon a crowd had gathered around me, laughing of course and I was completely stuck on the wall with no chance of coming off the wall. Then a little old man came up to me and took a very interesting tool and scraped me off in less than an hour, witch wasn’t long if you saw how stuck I was. In that time he also taught me the Phoenician alphabet by pointing to the wall. I thanked him and he seemed to know what I was saying. I really needed to teach him English, then I hurried back to the time machine that a bunch of little children were playing around on at this point and in about a minute I was back on the playground jumping rope. That night I took all of my information and made the perfect project to bring into class the next day. I was very proud of my hard work. At school the next day a gave the best presentation known to man on Phanecia, at least I thought that way. I got an A+ and now I am on the all A honor role at Grymes Memorial School. Today, I went to Greece. I admit, I may have skipped class and gone in the 5th grade time machine. When I arrived 6.2 seconds later, I stepped out in a field of green grass. I looked to either side of me and saw an army. One was ginormous. One was eh, not. I then realized I was on the great plain of Marathon. The armies I saw were the Persians, with the big army, and the Athenians, with the not so big army. A roar struck up and the armies broke ranks. I jumped in the time machine and flew to safety. This trip was significantly shorter than the last. In 1.3 seconds I was outside a giant coliseum. I believe it was shorter because I was closer to my destination in time and distance at takeoff. As I walked into the giant structure, I wondered why I came here. I love mythology, that’s why. I saw inside a chariot race about to take place. I got in the front row. I sat down but a man claimed it was his seat. I refused to move, remembering Rosa Parks. I was not thrown in jail. I was shoved into the track. I heard the shout of, “START”, and **I ran. I ran for all the good things I knew in the world. As the horses and drivers gained on me, I spotted a strange character. It had to be a god. My first clue was the way everyone avoided him, and then because he was floating. 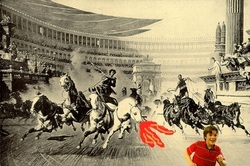 I also could not fail to notice his fire-breathing horses on the chariot. ** I dashed under cover for the next 30 minutes until the gates opened for exits. I raced outside, into the time machine. At home at last. Wait, I’m being told the time machine is just a tent. Apparently, it is only a movie prop. What just happened? On our class field trip, we went to the Pyramids of Giza. We had to crawl to get inside. I wondered why it was so small but it was to keep robbers from getting through. The tomb was once filled with riches. It was in their religion that you would need money in the afterlife. Inside it was like a maze. We walked about 5 minutes until we got to the first tomb. It was the one to trick the tomb robbers. The second tomb was a couple of minutes further and it held the body then we left. The class went to the museum where we saw mummies. We learned that mummies had their arms crossed if they were royal. We also learned the stages of mummification. They had a boat inside the pyramid. They believed it would help them get to the afterlife. They painted servants on the walls of the tomb because they would need servants in the afterlife. They filled the tomb with gold and diamonds and riches. They believed they needed to pay to go to the afterlife. They built an alter which was the pyramid. The pyramid itself is a tomb for the person. 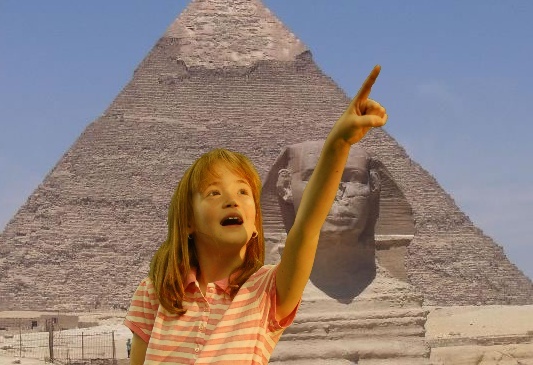 I recently went to Egypt and learned so much! I got there in the funniest way ever. I was riding a plane to the Himalayan Mountains to climb Mount Everest when the pilots of the plane said that we would have to go into the airport in Cairo Egypt. I had a great fear that I would not freeze but burn to death because I had packed all my heavy snow coats. I had to buy raggy clothes to keep cool in the hot weather of Egypt. Then I started my great trip in Egypt. I learned that the great Sphinx despite the great and hard rock they used in the structure, Had it’s nose destroyed by soldiers who used the nose as a target for practice shooting in 1798 during a war. The official language is Arabic but English and French are known throughout the country. I was really lucky to know that the official language of Egypt was English and French from a brochure someone gave me mysteriously. I would’ve been stuck if it wasn’t. The desert and the Nile River define the country with mountains too. The Nile is the largest river on Earth stretching 4132 miles’ wow! The farmers grow cotton, rice, corn, wheat and raise cattle. They export crude oil, cotton, textiles and chemicals. I learned this from the visitors center in Cairo. I went out of the city and visited the pyramids. I was walking up to the pyramid and then I saw a shadow. I looked up and saw an Egyptian pot flying through the air. I guessed it happened when the guy I saw climbing up the pyramid found that poor pot and threw it. It was the weirdest day of my travels. I told somebody to take my picture with the pot in the picture but he didn’t. I was furious with him! I just said you’ll do better next time. I went into the Cairo airport to go home and I found a plane going into Virginia. I rode the plane home and I said to my family: never go to any place expecting something to happen your way. Here I am fighting in ancient Sparta. If you think I’m crazy I might be a little, but let me explain how I got here. I was on a United Airlines plane for the Italy trip. I was fighting with my sister. It all started when I threw a hot wash cloth from first class. She was going to hit me with a pillow but a security guard got me first. I was thrown out in a Spartan airport. Spartan history associates took me from that very spot and threw me in a time portal. They didn’t know that the time portal would send me straight to ancient Sparta. Luckily, I went to ancient Sparta and arrived safe and sound. 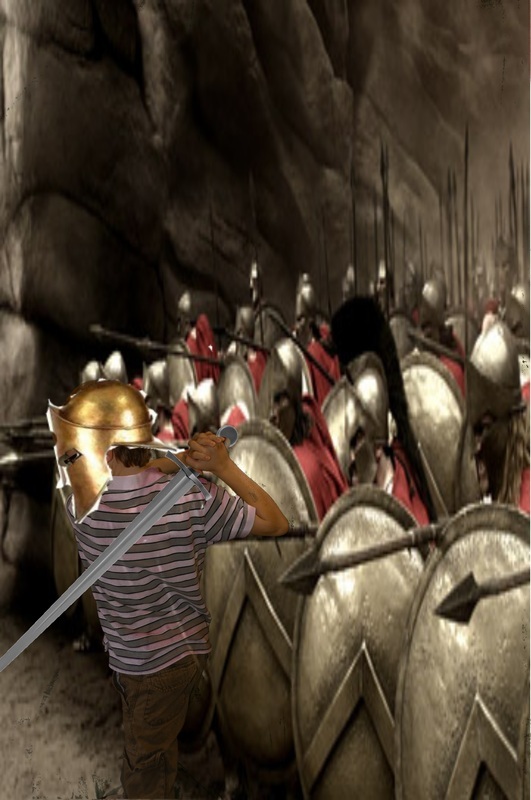 I’ve been trapped in Sparta since I was seven years old. 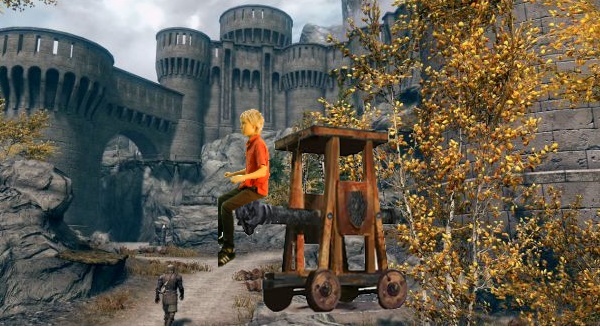 The army wanted to throw me off a cliff because I was weak when I was seven. I told them I would get stronger so I was drafted into the army. I’m in the barracks right now. I’ve been in these barracks for four years since I am eleven. The Spartan warriors are harsh to their slaves. They call them helots. I have to go; sword practice starts in three minutes. Oh, the trainer is mean. He beat my friend because he had stolen a fox for food. My friend had planned to cook it later.